Russia and Norway are scheduled on Tuesday to launch another joint expedition to determine the condition of a sunken nuclear submarine and containers of radioactive waste and spent nuclear fuel dumped by the Russian Navy over a period of decades, the Norwegian Radiation Protection Authority (NRPA) said. Russia and Norway were scheduled on Tuesday to launch another joint expedition to determine the condition of a sunken nuclear submarine and containers of radioactive waste and spent nuclear fuel dumped by the Russian Navy over a period of decades, a spokeswoman for Norwegian Radiation Protection Authority (NRPA) said, but the departure of the research vessels has been delayed because of mechanical difficulties. An NRPA spokesperson told Bellona the mission was scheduled to leave last week, but technical problems with the vessel pushed the departure back to Tuesday. On Tuesday, the spokeswoman told Bellona she had received an email from NRPA representatives in Russia saying persisting problems with the expedition vessel’s propellers will delay its departure until Thursday or the weekend. 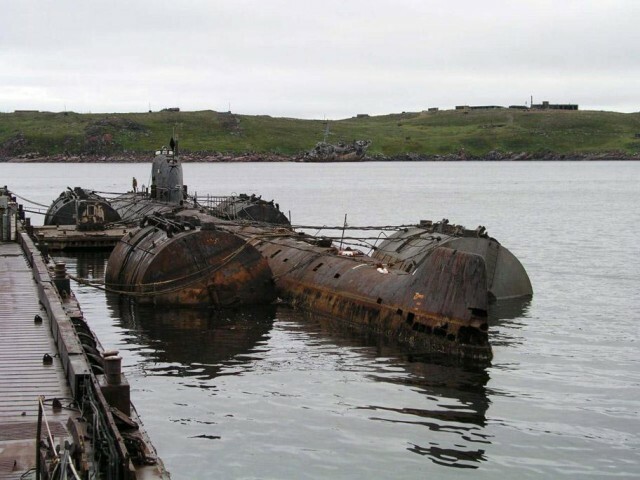 The aim of the expedition will be to determine the radiological threat posted to the environment by the sunken K-159 nuclear submarine, which went down in the Barents Sea in 2003 while being towed to dismantlement at the Polyarny shipyard near Murmansk, according to the NRPA and the Russian news portal murman.ru. Amundsen said the expedition will be at sea for three weeks. The K-159’s sinking killed nine sailors who were onboard the derelict vessel to plug leaks during its tow from Gremikha. Rough weather swamped the vessel and broke its towline, and it went down with 800 kilograms of spent uranium nuclear fuel in its two pressurized water reactors. Though the Russian government has repeatedly said the vessel poses no radiological threat, and has promised to raise it on numerous occasions, most recently in late May, the vessel is considered one of the most radioactively dangerous objects on the bottom of the Arctic seas. “The submarine was in very bad condition when it sank, and there have been unconfirmed rumors of Russians have measured radioactivity at the wreck,” Nils Bøhmer, Bellona’s general director and nuclear physicists, said. “It is therefore important that Norwegian authorities now make ​​their own measurements,” he said, added, “The K-159 is just the mouth of the Murmansk Fjord, right next to some of the world’s most important fishing resources, he said, noting that even rumors of radioactive leaks could be damaging for Norway’s fishing industry. According to NRPA, a catalogue of waste in the Kara Sea released in 2012 includes 19 ships containing radioactive waste; 14 nuclear reactors, including five that still contain spent nuclear fuel; 735 other pieces of radioactively contaminated heavy machinery; 17,000 containers of radioactive waste, and the K-27 nuclear submarine. Russian and Norway have frequently collaborated on mapping and inspecting nuclear waste on the Arctic sea floor. The first joint missions took place between 1992 and 1994. The current expedition, taking place under a joint cooperative agreement between the NRPA and Russia’s Hydrometeorology and Environmental Monitoring Agency, or Rosgidromet, includes 15 researchers who will set sail aboard the Russian scientific vessel, the Ivan Petrov, according to the murman.ru Russian news portal. Observers from the International Atomic Energy Agency (IAEA) are also taking part, the portal reported. The expedition will concentrate on problem areas of submerged radiological hazards in the Barents Sea near the Murmansk region, said the murman.ru report. It will take spectrometric measurements, as well as focus on the condition of the K-159 with the help of remotely operated submersible cameras. The last such joint mission took place in 2012, when 16 Russian and Norwegian scientists inspected the condition of the K-27 nuclear submarine, which was scuttled as nuclear waste in a shallow 50 meters of Stepovogo Bay on the Novaya Zemlya Archipelago in 1981. The Soviet Navy dumped the K-27 with spent nuclear fuel packed in its reactors years after a 1968 reactor leak killed nine sailors. The navy attempted repairs, but decided instead to seal its reactors and sink it. Data from the 2012 expedition show no rise in radiation releases, but Norwegian scientist said lifting the sub should be a priority. Recent statements from Russian Emergency Services Ministry officials and the scientific community have indicated the situation with the K-159 is growing more urgent. In April, the Emergency Services Ministry advised Russia devise a plan for raising both the K-159 and the K-27. 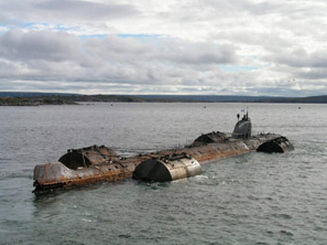 But the position of the K-159 is especially precarious, said Anderi Zolotkov, director of Bellona Murmansk. The wreck is located near Kildin Island at the mouth of Kola bay. The 11 years since it went down have seen a steady increase of shipping in the area, which abuts the Russian and Norwegian coasts. The joint expedition to the K-159 will assess whether the radioactive condition of its hull has worsened since it was last inspected seven years ago. Russian specialists are optimistic the sub can be raised, but such promises in the past have gone unfulfilled.